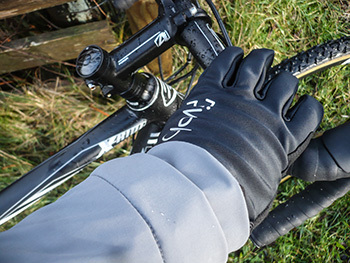 rivelo winnats bibtights, langcliffe waterproof jacket and symonds softshell winter gloves. 'tis the season of fripperies, of that there is little doubt. how many amongst us have agonised for hours or perhaps even days, trying to find the very best present for someone who already has pretty much everything they need or want? admittedly, this is not a difficulty related to children or maybe even teenagers. they will happily accept anything to which the apellation gadget might be applied. as a disinterested adult, i see no earthly reason why anyone with an x-box would also need a playstation and nor can i distinguish between a ps3 or 4. don't they all accomplish the same function? and if you already have an iphone, why would you need an ipod? you see what i mean? it is perhaps not any simpler to find the present of choice for the avid cyclist, particularly if on a limited budget. there are a number of accessories that might conceivably fit the bill, but assuming the present-giver has as much idea about cycling as do i regarding game-stations, that realm of choice is fraught with pitfalls. it is possible to purchase a pair of 25mm tyres for around £25, but would those offer the sort of rubber on which you'd like to travail the highways and byways? and perish the thought that someone might wrap a budget saddle on the grounds that it was "almost the same colour as that bike we saw you on last week." in the light of the above evidence, a scenario that is easily transferable between disciplines and activities, suddenly fripperies begin to take on a new and more appealing light. the heck with whether auntie madge really needs a merino wool hot water bottle cosy; the choice is already made. 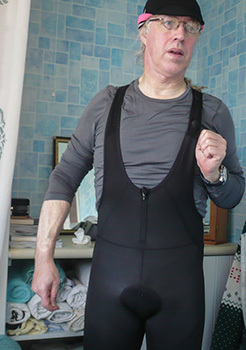 it is, therefore, of some comfort to come across a brand of cycling apparel for which the word frippery has been dropped from the corporate vocabulary. 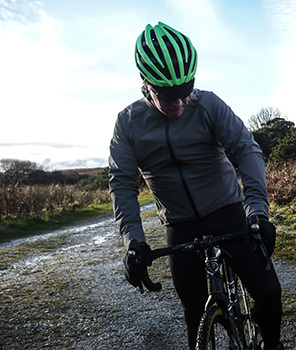 rivelo are a cycle clothing company which has not previously crossed my hebridean radar. currently offering a limited range of products, i was sent a waterproof/windproof langcliffe jacket, a pair of winnets winter bibtights and a pair of symonds softshell winter gloves. 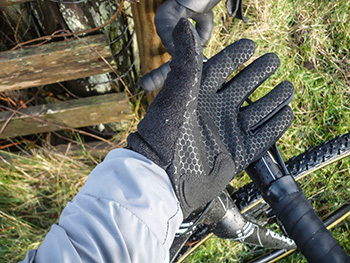 if i might be so bold to commence with the latter, these are a streamlined and extremely well-fitting pair of softshell gloves retailing at a very amenable £30. they couple well with the langcliffe jacket, offering a sizeable velcro fastening cuff that can be closed over the inner cuff of the jacket, while being protected by the waterproof outer. the only discrepancy here is perhaps in the definition of the adjective winter. there is no questioning their windproofing, or indeed their water-resistance under light rain conditions, but a modicum of insulation would have been nice. hands will often lead the charge into a windchill of minus two degrees, at which point, your symonds encased fingers will still be cold. however, i fear i may be nit-picking, for they do offer a hard-wearing constitution, an appropriately padded palm and a substantial and well-placed section of soft towelling to ease that snotty nose. having already made mention of the langcliffe jacket and its symbiosis with the rivelo gloves, it seems only pertinent to pay tribute to its overall propensities. hebridean weather being as it is, it did take more than a few rides to get the langcliffe wet, though only a few minutes to appraise myself of an excellent degree of windproofing. and matching the latter, the breathability of the porelle dry membrane was actually quite impressive, a feature that advertised itself over several tens of kilometres. however, according to rivelo's website, one of the purported advantages of porelle dry is its remaining dry to the touch. with this, i'm afraid i would have to take exception. 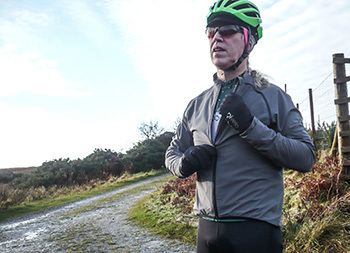 though the inner lining of the jacket's torso was only marginally clammy after an 80km ride in galeforce winds, the same could not be said for that in the sleeves. the internal clamminess made it not only tricky to remove the jacket without pulling the sleeves inside out, but somewhat tacky when putting it back on. one of those lightweight mesh liners might be a possible solution. in my opinion, it is impossible to purchase a 100% breathable cycling jacket, but the langcliffe is certainly in the upper regions. with taped seams, drop tail, a weatherproof full-length zip and a very handy single rear pocket it's a well-fitting and ideal jacket for the weather conditions at which it is aimed. rolling it up and stuffing it in a rear pocket was not quite as straightforward as i'd hoped, with a larger portion visible than i'd have liked, but to a certain extent, it depends on the jersey du jour. as this is the west coast of scotland in december, remaining dry was never going to be a permanent option and the langcliffe did indeed meet its wind-driven waterloo. i did have my concerns after a mere thirty minutes of admittedly heavy rain and a galeforce headwind. the ever-attractive array of water droplets rolling off the sleeves rather quickly turned to that soaking wet look as the outer fabric gave a remarkably accurate impersonation of becoming waterlogged. however, impressively enough, very little of that precipitation made it through to the other side and when the rain desisted, the fabric dried impressively speedily. several hours in a similar level of inclement weather might be a less than desirable situation, but to be honest, a wet sunday morning on islay in mid-december will scare the living daylights of many a waterproof garment. 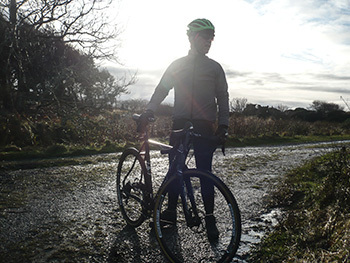 the winnats bibtights, lined with thermo-roubaix and with a durable water repellency coating on leg and seat panels were very much the icing on the cake. several rides ago, i wore my showers pass waterproof socks and stupidly did so over the top of the bibtights i was wearing at the time. when it rained, as it has a habit of doing, the water ran inside of the socks, totally negating their efficacy. however, part of the reason for my sartorial faux pas was brought about by a difficulty in rolling up the tights legs far enough to fit the socks. 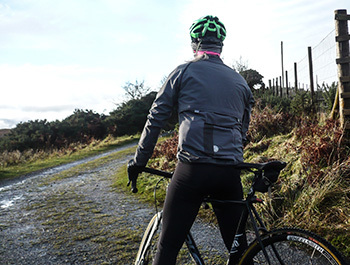 obviously the same thing has happened at rivelo headquarters, for they have thoughtfully provided rear, calf length zips, not only easing the process of getting the tights on and off, but simplifying the wearing of long, thick waterproof socks. the fit is marvellous and the high front panel that magnifies the winter description features a zip, once again easing the act of wearing and removing as well as those moments when a call of nature becomes a living necessity. though that dwr coating is scarcely designed to have your internals remain dessicated, that on the seat panel went a long way to ameliorating the soaking provided by a cyclocross bike with no mudguards. at only £130 per pair, these most certainly do not reside under the heading fripperies. for a cycling apparel provider without too many ageing calendars in the ceo's bottom drawer, rivelo seem to have hit the ground more or less running (or pedalling, if you prefer). my minor criticisms notwithstanding, the three items under consideration offer remarkably good value for money with the added bonus of being particularly stylishly designed, yet immensely practical. it must surely be something of a struggle to not only make a name in an all but overcrowded cycle clothing market, but both survive and progress. rivelo may just have found the right strategy. the langcliffe jacket costs an impressively economic £130.